The Victoria and Albert Museum (often colloquially known as the "V and A", or abbreviated to "V&A") is a large and famous museum in South Kensington, London . 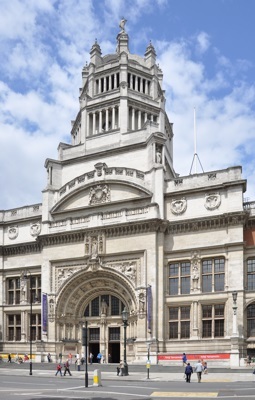 The Victoria and Albert Museum is one of three large museums in the area, along with the Natural History Museum and the Science Museum. The museum was founded in 1852, and is today is home to more than 4.5 million art and design objects. These include the world's largest collection of post-classical sculpture, and is also strong in Italian Renaissance Art, East Asian art, and Islamic art.